I wasn’t going to post early in order to build up a reserve list of posts but I want to put up a work in progress list for my trip in October now before it changes too much! As it is, the list I wrote two days ago is already slightly out of date. There won’t be any new pictures with this post as I’m in the process of tidying things up and a few things are waiting for me to post all about them properly (so no big spoilers, hey). Hopefully the next “getting ready” post will have evidence of progress. I’m splitting everything into four categories: Ready, In Progress, Under Construction and Needed. I’m not entirely happy with the list “as is” but it uses models I already have. Once they are ready(ish) and if I still have time, I might go off piste and build something different. I’ve also got some Harlequins simmering away part painted (waiting for some edge paints for the test model) but the first priority is to get 1000 points done. I’m actually having a slight “hand” dilemma at the moment as I don’t have quite enough empty hands to go round. If that carries on being the case, I will be buying more kits out of desperation (I have spare marine arms, Lizardmen arms and access to Daemon and Ork arms, none of which are the right size or shape) or tweaking my ideas to fit what I have. Currently this all adds up to 1006 points and a lot of problems, namely an over-abundance of HQs. 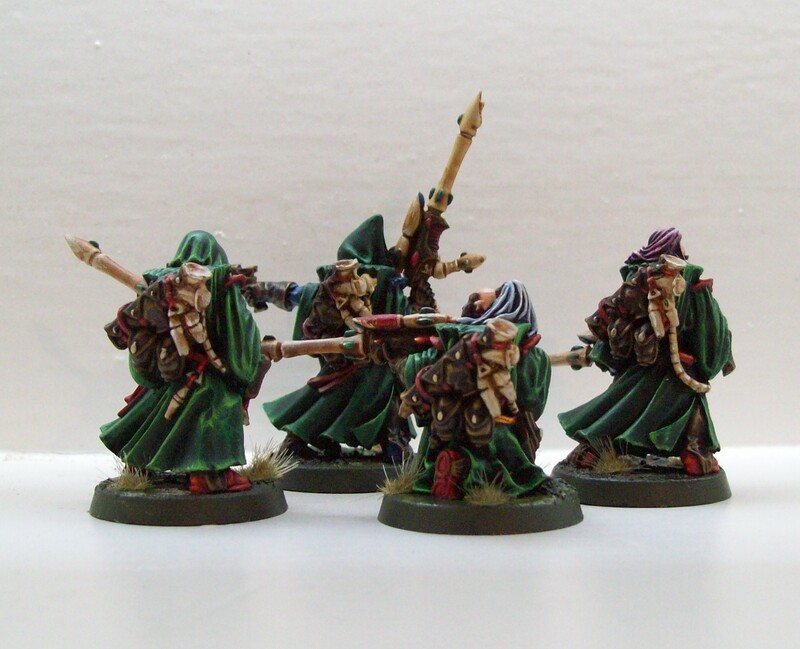 I was originally thinking of adding a Seer Council formation to my list as it goes nicely with my theme (Elves! On Dinosaurs!) and fluff (Exodites defending their home against allcomers) but that’s very points heavy. In the end I may have to drop the Spiritseer and have two CADs and spend the newly released points on something else. The other thing I’m missing is something other than a Flyer that can deal with armour. I played with my Exodites in a Tactical Strike Event where I was twice stymied (once was my own fault for forgetting that I had grenades on my Autarch) for having nothing that could deal with vehicles. The Crimson Hunter packs a very hefty punch but at the moment it’s the only thing that does. If I have time I’ll add some more heavy weapons to my list somehow or other. Anyhow, my next job is to finish this highlighting! Until then! I have been making a fair bit of progress recently (for me at least). 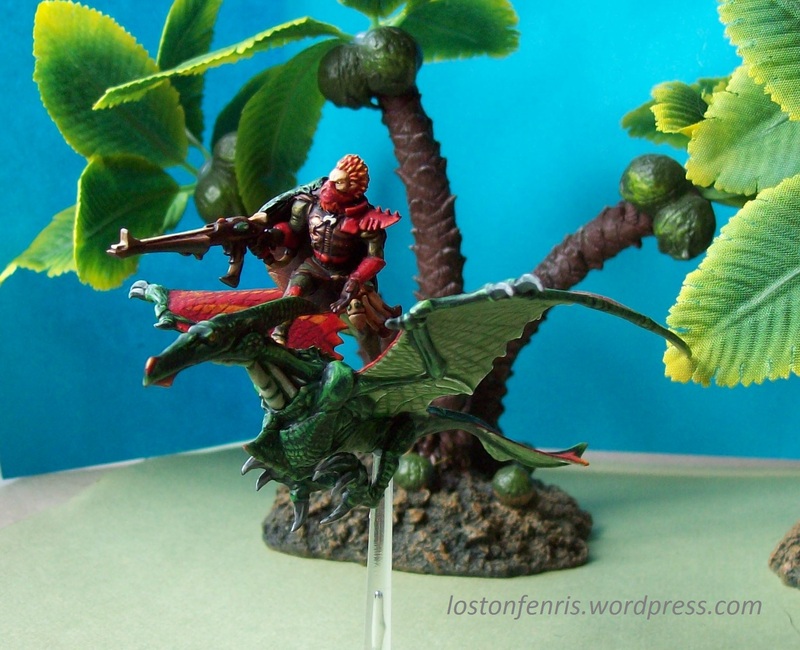 I bought some Terradon Riders/Ripperdactyls for some Guardian “Jet” Bikers. 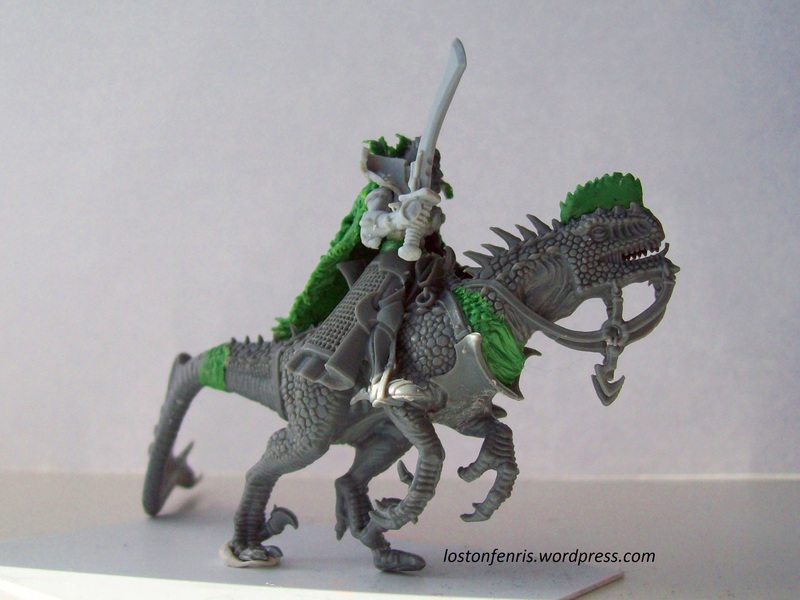 The Lizardman kit is great, straightforward to put together and with plenty of extra bits. It also fits well with the Helion legs that I had in my bits box (well, chest). One is finished, save for a base, the others are in the progress of being painted. 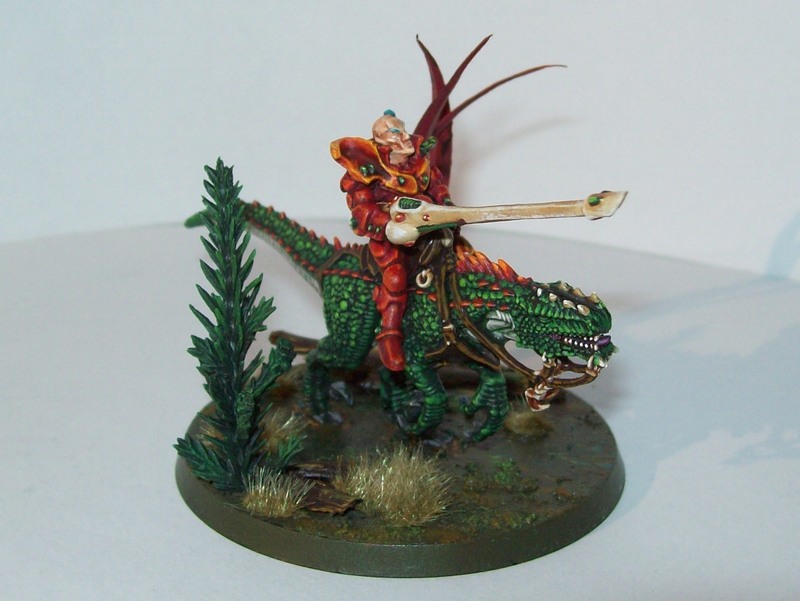 I have another three dinosaur riders to finish too. One “Shining Spear” is in the progress of being painted, as is an Autarch on “Jet Bike”. The other dinosaur riding “Shining Spear” is still in bits. My current plan is to finish the models that are in progress of being painted before working on the last unpainted guy although I don’t know how much I’ll get done this week as I have things that take priority this week (see 2 and 3). First up, I need to really learn the new ‘dex and explore what lists I want to build. I need to remind myself of all the special rules and point changes and learn how to coordinate everything. Fortunately, the feel of the new ‘dex is not wildly different to the old, and, after months of not knowing what to do, I’m picking up Space Wolf sprues again and planning things! 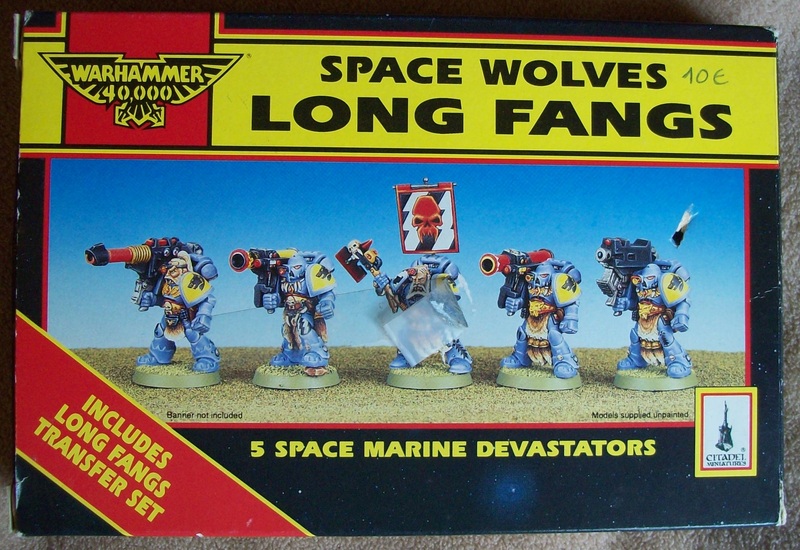 I bought a box of very old Long Fangs last autumn and I’m going to strip the two that need the old paint removed and paint the lot up. This week I want them stripped of any old paint and prepared for painting. I’m also going to build another Swift Claw and basecoat him too. I’m building and painting these Fiend conversions for my boyfriend. One’s done and there are three to go. He wants them back so I need to work on them. In particular he wants at least three of them ready in time for the Overlords’ Haven event in two weeks, so I really need to get cracking! These are my priority as I should be able to get them to tabletop standard (if not finished) fairly quickly. 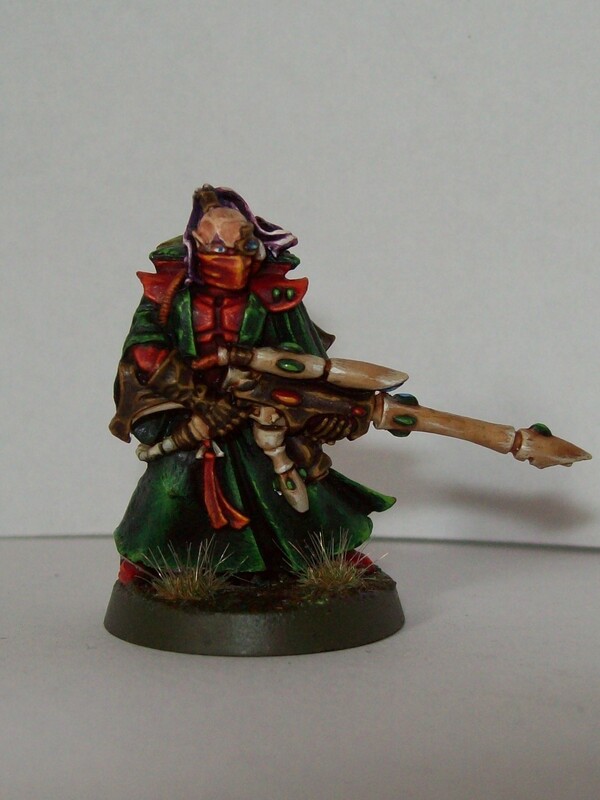 Anyhow, by next week I want to have a post up showing at least one finished model! Hopefully I can find something else to post about too. Until then! So, a few weeks back I moved back to the UK and my laptop promptly broke. I’m currently making do with my ancient and unwieldy tablet which is not particularly good considering that it has no word processing capacity and the multitouch software is a little bit buggy. This meant that the two posts I tried to write using it were binned rather than posted, so I’m writing this on my Mum’s laptop. It’s kind of a pity that I’m disconnected at the moment as there’s so much going on. First of all the Stormclaw boxset is out and I’ve split a set with my boyfriend. I’ve not seen it yet, seeing as it was sent to him and I’m currently at my folks’ house, but I’m looking forward to it, I need something to encourage me to paint more Space Wolves. The other thing that looks like it might encourage me to paint more Wolves are the current rumours that a new codex is coming very soon. I enjoy playing with my Space Wolves but I need a little new inspiration for models to paint. Secondly, I’m back building and painting more Exodites. I spent some leftover Christmas money on a couple of kits and I’ve been busy using them for some conversions. I’ll post a little taster here. Sorry for the picture quality, again, I’m missing my laptop. 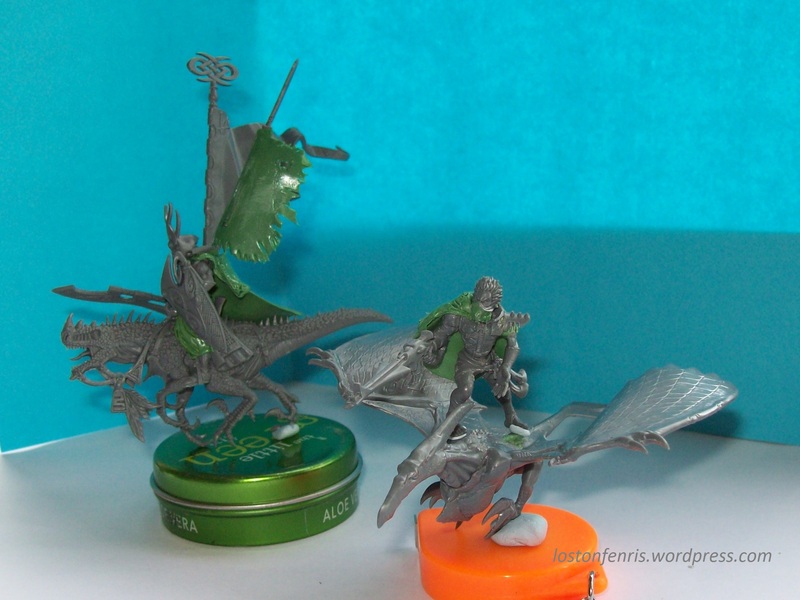 The guy on the Cold One is going to be an Autarch on “Jetbike”. He deserves a post to himself when he’s finished so I’m not going into detail now but he was an impulse build after I flicked through the Eldar Codex and read the description of their wargear and found a use for one of the rather lovely Wood Elf Eternal Guard shields. The other guy is going to be a Guardian Jetbike rider, although I’ve used mostly Helion bits to build him. I like the fluff that says that Guardians are everyday Eldar from other paths who have answered the call to arms, so I’ve tried to make him look a little less staid and polished than his kin in the Shining Spears. 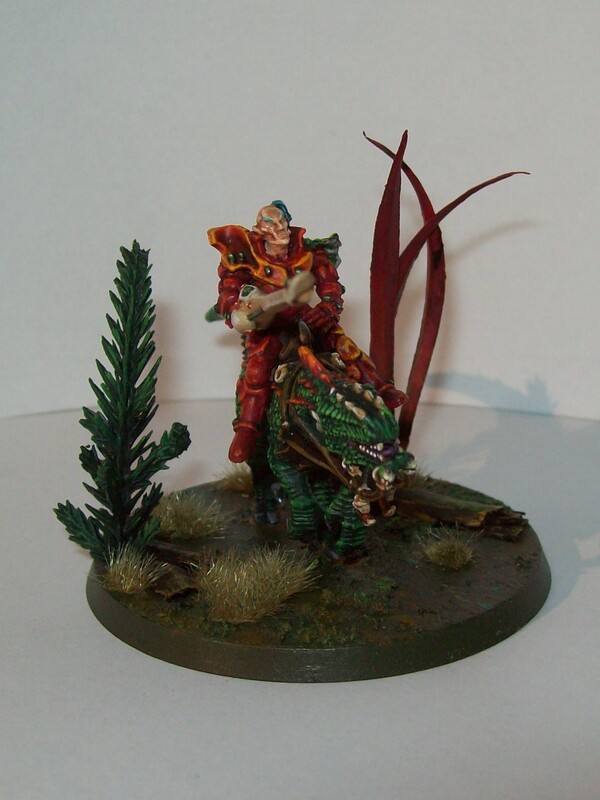 The Terradon Riders kit also screams out for a less rigid rider than the Cold One Knights kit. Finally, I should encourage you all to go my boyfriend’s new blog at www.redsquigracing.com. 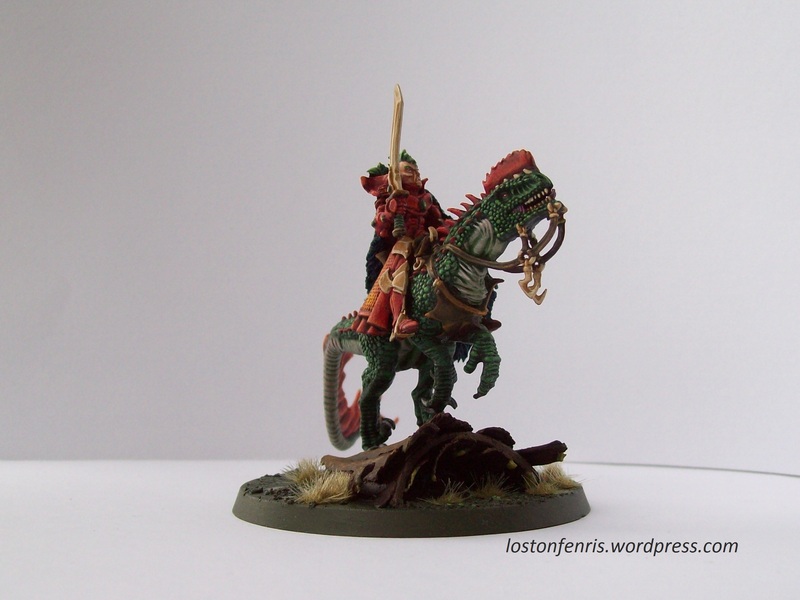 He’s my usual Orky opponent as regular readers might already know, and he’s finally set up a blog for his Orks, so go and take a read. Hopefully I’ll have my computer back in a couple of weeks (with a brand new hard drive- ouch) and I’ll be able to get back into posting with the renewed vim and vigour, I’ve frankly been missing recently. Until then! 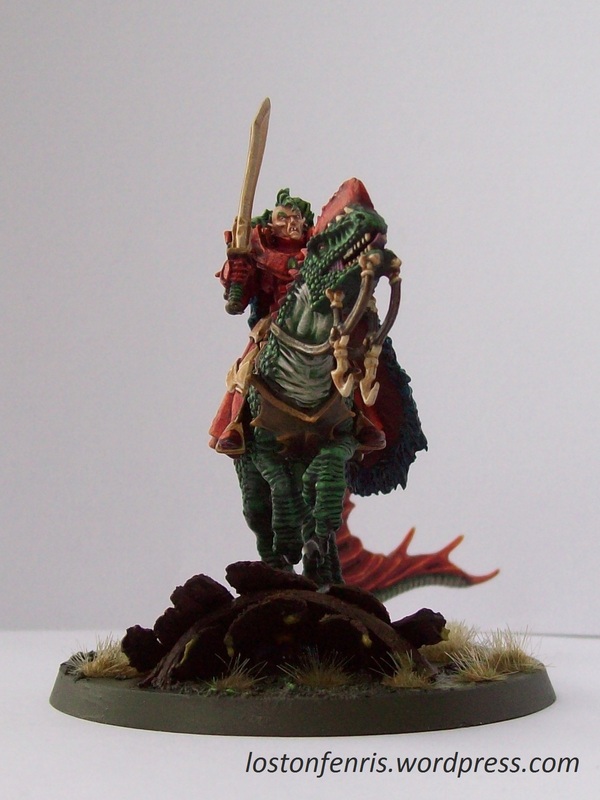 This guy took me a lot longer than I had hoped, partly because I went a bit overboard with the conversion. I won the Dark Elf War Hydra tail in a painting contest at my local GW a few months back. The prize was three bits from the box and as soon as I saw the tail I knew what I wanted to do with it. It took a fair bit of effort to get it to fit on a Cold One model and I didn’t entirely succeed but it makes for a larger (much larger) and more powerful looking mount for what (unless he gets a promotion) is currently my Shining Spears Exarch for my dinosaur riding Exodites. I had to extend the neck of the Cold One with some green stuff in order to balance the model. The rider himself has Dark Elf Cold One Knight’s legs (I broke the Shining Spears ones), a Shining Spear torso and sword arm, a Dark Eldar Hellion head and an Eldar Guardian left arm. 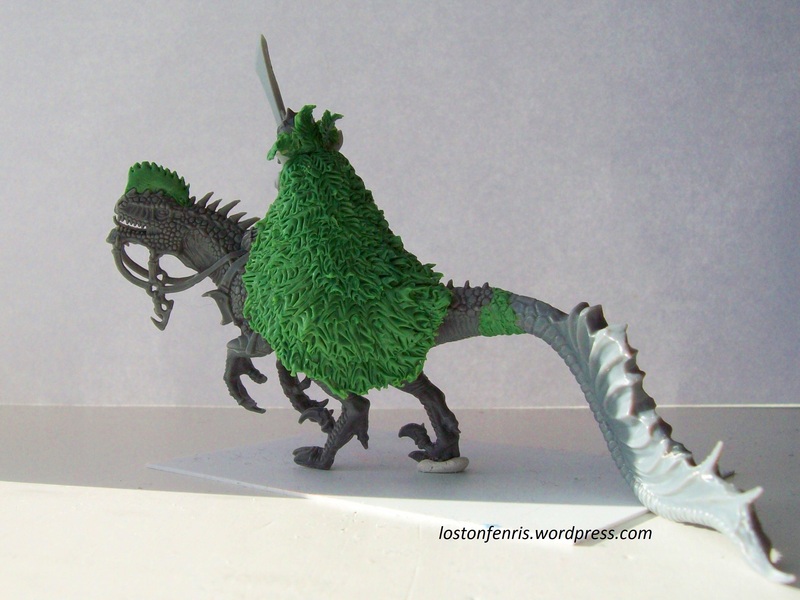 The feathered cloak is green stuff and was built by using a sharp modelling tool to rip and cut into soft green stuff to make a feathering effect layer by layer from the outside in on top of the basic cloak base. Sorry for the quality of the photos of the unpainted model. I obviously can’t go back and take better ones and I didn’t realise just how bad they were at the time! I used the same paint scheme as for my other Shining Spear so I won’t go over it again. For the cloak I started with Kantor Blue, washing with Drakenhof Nightshade and highlighting with Macragge Blue, Hawk Turquoise (Sotek Green), Ice Blue (Lothern Blue), Space Wolves Grey (Fenrisian Grey) and Skull White (White Scar). I based the model using a piece of cardboard tube from a roll of clingfilm for the skeleton of my tree chunk with a crushed cinnamon stick as bark. I used Middenland Tufts for the longgrass and liberal amounts of Lustrian Undergrowth and Agrellan Earth to add texture. The spider came from the Deathworld’s basing kit. I love the new Nurgle’s Rot paint and I used a fair bit to add slime to the model, particularly as my water effects stuff has dried up. 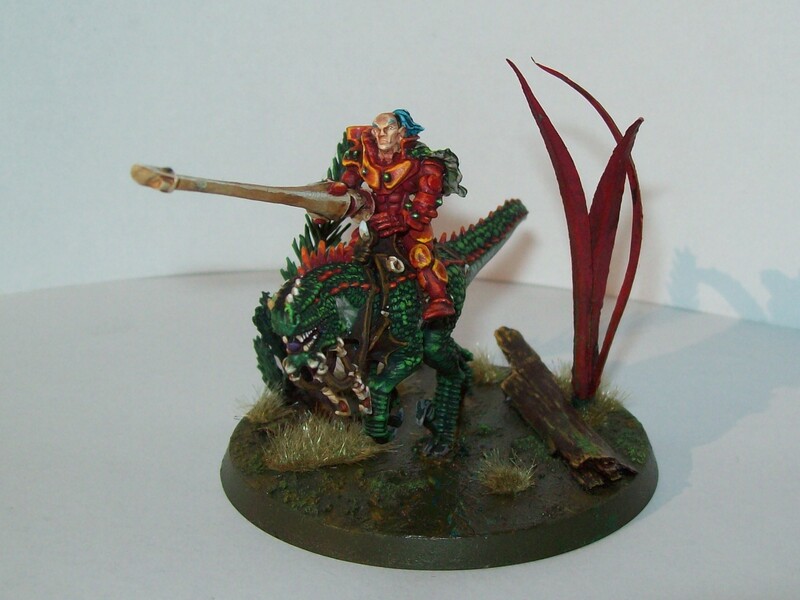 Anyhow, that’s one more model done for my Exodites. I’m going to paint a few marines next I think for a change of pace! Sorry for the lack of posts recently, I’m struggling to be motivated about anything for long (except possibly Gotrex and Felix considering I’ve just read all the series as far as Zombieslayer in about ten days). 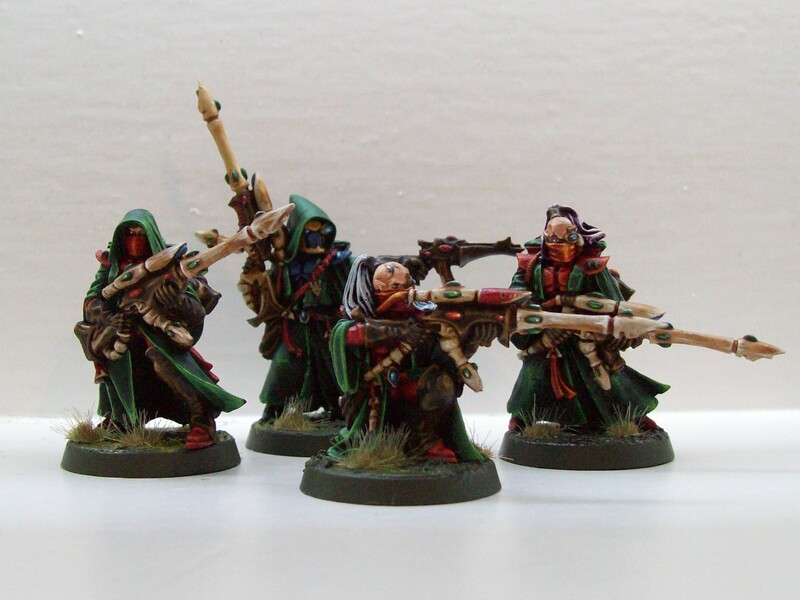 It’s life rather than 40K so I’ve been pottering away whenever I feel up to doing more than sulk and I did manage to almost finish my first Eldar Exodite squad (you’ll see why I say almost in a bit). I decided that any Exodites in my army would be helmetless which caused a bit of a problem when it came to the two helmeted guys in the squad, so I picked up on some Eldar fluff and made them Alaitoc Outcasts currently hiding out with my Exodites (which still don’t have a name). I detailed how I painted the first Ranger here so I won’t go into details now. For the Alaitoc guys I used Iyanden Darksun (Averland Sunset) for the yellow bits, washed with Seraphim Sepia and highlighted with a 50:50 mix of Iyanden Sunset and Bleached Bone, while for the blue bits I used Macragge Blue highlighted with Alaitoc Blue. Now, the sharp eyed among you would notice that I only have four Rangers in that picture when really I need five in the squad. The reason is below. I’d stored these guys for a while until I was ready to finish highlighting them (which turned out to be yesterday) and I pulled them out of the case to find that one of the models had got damaged. It turns out I need to be a little bit more careful storing these guys as the resin is a little bit delicate! Anyway, that’s it for now. Hopefully I’ll get off my backside and post something else soon! 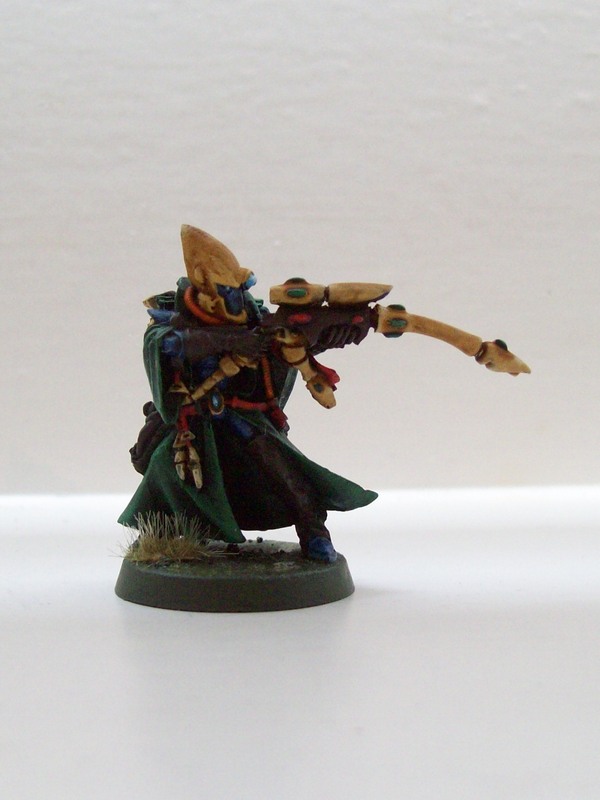 I took a decisive step forward with my Eldar Exodites and built and painted my first Shining Spear. 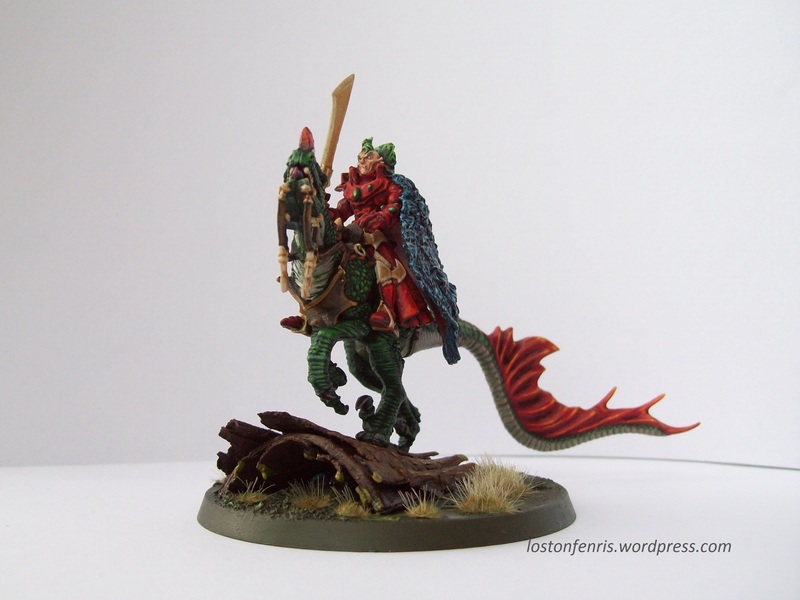 I love the cover of Promethean Sun and the dinosaur riding Eldar on the front and so I’ve used that idea for my Shining Spears. I used the Dark Elf Cold Ones Knights kit for the mount and the head. The rest of the model was from the Shining Spear upgrade kit. I removed the head from the Shining Spear model and the controls from the left hand. 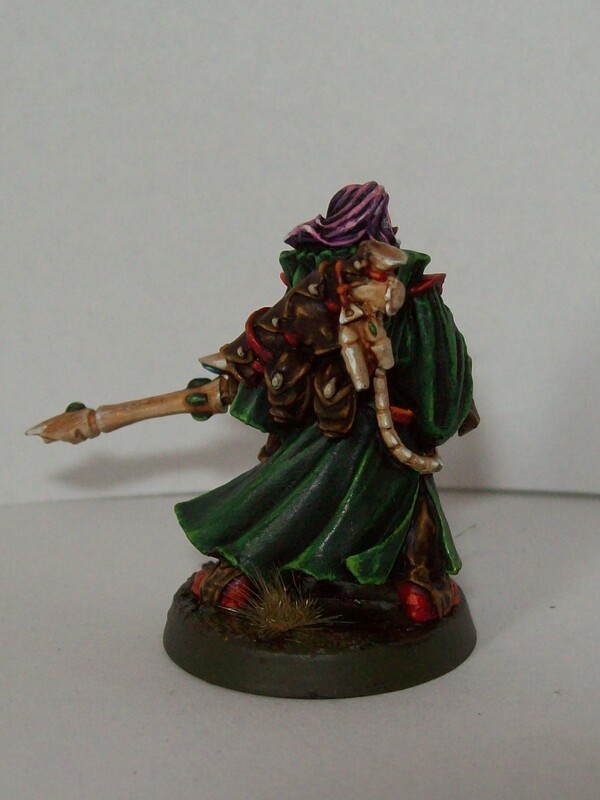 I have to admit that I was glad that the model was Finecast (shocking I know!). The soft resin is much easier to cut than plastic or metal and I could adjust how the rider sat on the dinosaur with judicious blasts of the hairdryer! I can cope with bubbles and flash if I can save several days of work elsewhere! I used green stuff to bring the neck and torso together and for the scrap of hide on the left shoulder. For the base I used some scraps of cinnamon sticks from and old packet in my kitchen for the logs and some bits of a fake plant for the leaves. Once I had painted the model I used Water Effects mixed with either Devlan Mud, Guilliman Blue + Waywatcher Green or Waywatcher Green for the more liquid parts of the base and some Middenland Tufts for the clumps of grass. 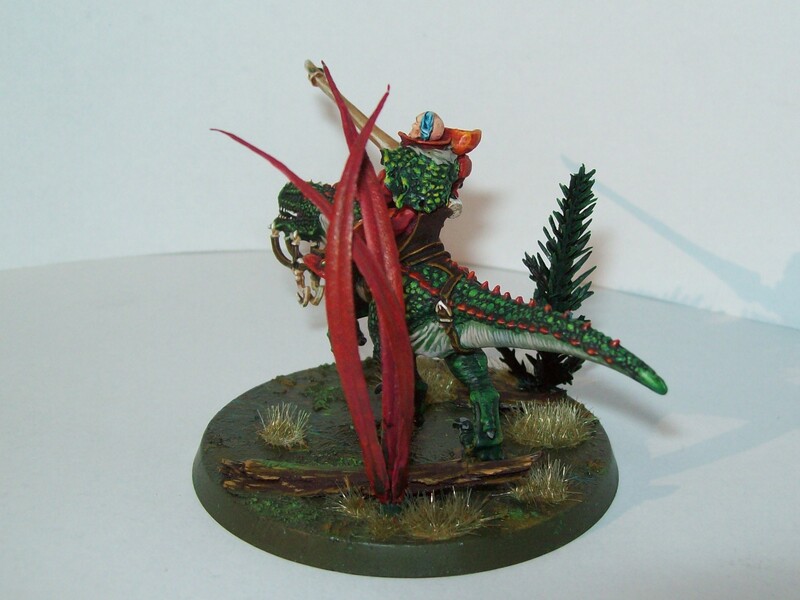 I’m using autumn colours on this army so, having painted the dinosaur green, I used reds and oranges on the model. I wanted to make the Shining Spears a bit different from the Rangers, so I used the orange to break up the red. I need to build the rest of these guys now and finish the Rangers. 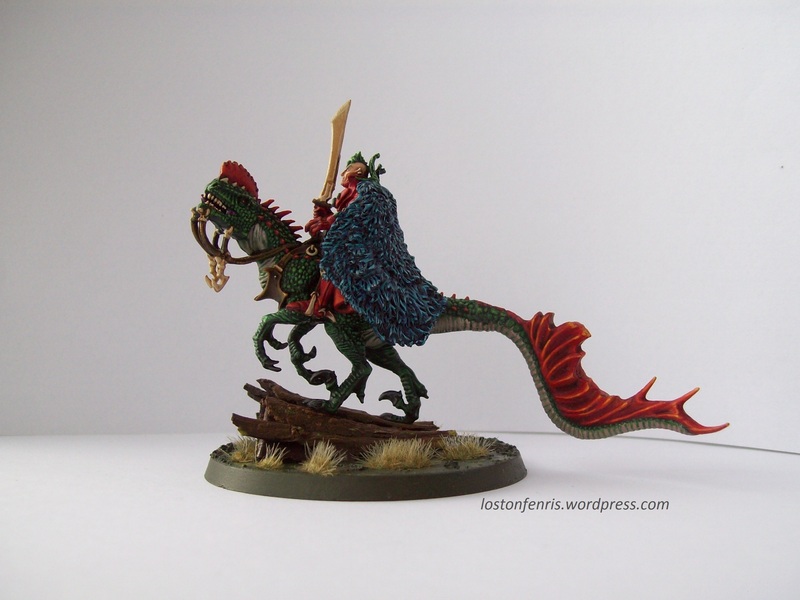 While the Shining Spear was great fun to paint (even if the scales were a bit wearing after a while) he took more than a day to build so I guess that it will take me some time to do the other three. Still, this project isn’t so much about speed but about building and converting an army that is a bit different and which allows me to be a little bit creative.